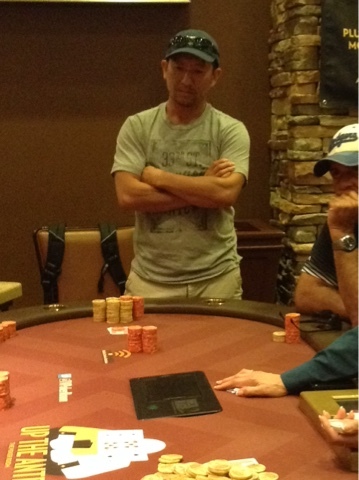 There's already 70,000 in the pot preflop and Greg 'Spartacus' Pincombe and Fong Yang are going at it on the flop. Pincombe makes it a pot-sized bet, Yang re-pops to 200,000 and Pincombe announces all in for 401,000 total about 45 seconds in to the 10-minute break the field is now on. "I know my pair is bigger than yours," says Pincombe. "You have Jacks?" asks Yang. "I don't shove my stack lightly," Pincombe responds. "What do you want me to do?" Yangs asks, gets no reply so he asks a different question. "Will you show if I fold?" "You show me your hand, I show you mine," Pincombe says as the clock hits 4 minutes since break began. Yang somehow finds a call, says it aloud and quietly says, "I got nothing," as he flips up Q-T for top pair, queen kicker. Pincombe turns over and Yang celebrates finding out he's ahead. The board runs out and Yang becomes the first player to a Milly in chips as the dealer counts out the stacks to see Yang has fewer than 2BB more than Pincombe.